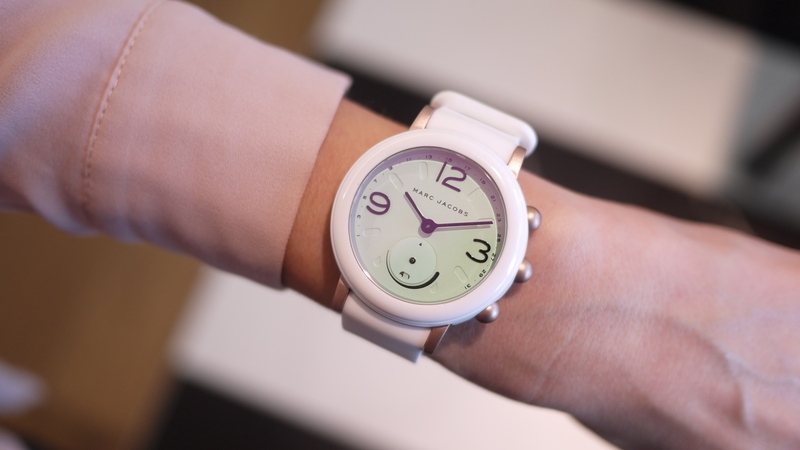 Marc Jacobs is getting into wearable tech with the Marc Jacobs Riley hybrid smartwatch. We've just seen two styles of the new connected watch line, made by the Fossil Group, over at Baselworld and they look pretty damn funky. The colourful, connected Riley is based on the existing Riley style and copies its round face and oversized numbers on the watch face. In other words, set your dials to quirky. The models we've seen have a white plastic body, strap and watch face with purple/black/metallic details, and a black plastic watch body and silicon strap with a green watch face and white/metallic pink/metallic purple details. Plus at IFA we got a look at a textured new strap with a metal finish buckle as well as slightly tweaked styling on the black watch face (see below). All the models look small-ish on women's wrists but come with a playful-looking, fat bezel around the watch face. Like its siblings across designer names like Kate Spade, the DKNY Minute and Tory Burch Collins, the Marc Jacobs Riley hybrid connects to iOS and Android phones but doesn't have a touchscreen. Instead, there's fitness tracking which you view via the app, vibrations for smartphone calls, message and app alerts and a long-lasting coin cell battery so you won't need to charge it every night. The regular dumb Riley watches have a crown whereas this connected version has three 'pusher' buttons which you can customise in the app for things like using your watch as a remote control for selfies, playing/pausing music controls and finding your phone. And that's the lot, it's a pretty simple feature set. It is set to go on sale in Fall 2017 but as with the rest of the Fossil Group line-up for Baselworld, we don't yet know the price or exactly how many styles we're looking at. Stay tuned for more first impressions of new Baselworld smarwatches and fashion-focused hybrids, plus any fresh details on the Marc Jacobs line as and when we get them.